Corneal Molding (ortho-k, CRT, corneal reshaping) is the fitting of specially designed contact lenses that you wear overnight to correct your vision while you sleep. While you are asleep, the lenses gently reshape the front surface of your eye (cornea) so you can see clearly the following day after you remove the lenses upon awakening. Because the corneal molding effect is temporary, little risk is involved, and you can discontinue wearing the lenses at any time — provided you are willing to start wearing glasses or contacts again when your prescription returns! Children and young adults who want to be glasses-free but are too young for LASIK often are good candidates for corneal molding. Those that are not good candidates for refractive surgery for other reasons (dry eyes, for example) are also typically excellent candidates for corneal molding. Patients who participate in contact sports or work in dusty environments that can pose problems for contact lens wear also can be good candidates. If you have tried contacts for years without the comfort and vision you had hoped to achieve, you may be a good candidate for corneal molding. 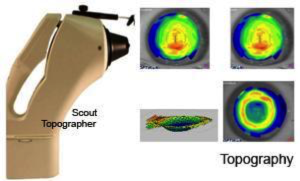 The doctor will begin by measuring the curvatures of your corneas using an instrument called a corneal topographer — a painless procedure that takes about a minute and produces a topographical map of your eye’s surface. Using this information and specialty software, a custom lens will be designed specifically for your cornea. Dr. Elston is a Certified Wave Lens Designer and is excited to bring this lens fitting technology to you. Ask today about the benefits corneal refractive therapy can bring you!